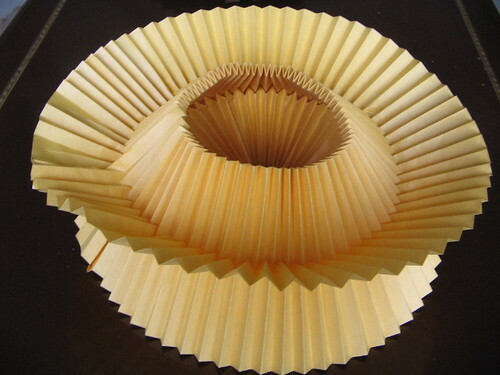 The Origami Forum • View topic - Corrugation? 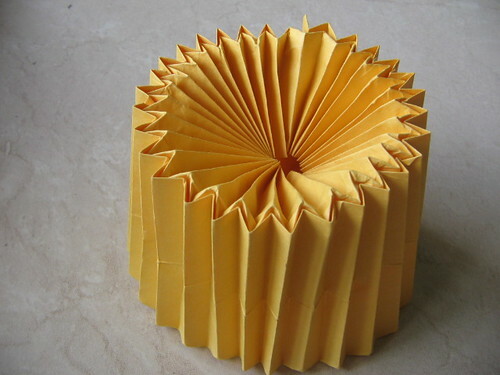 I read here a definition of an origami corrugation, as opposed to a classic tessellation, but I didn't really get it. Can you please help me understand what it is? I don't think it is as clear cut a definition as the author would like, but the basic premise is the number of stacked layers in the paper. If you hold it up to the light and no new layers are visible it's a corrugation. If a different or more expansive pattern emerges it's a tesselation. Grace159 wrote: I don't think it is as clear cut a definition as the author would like, but the basic premise is the number of stacked layers in the paper. If you hold it up to the light and no new layers are visible it's a corrugation. If a different or more expansive pattern emerges it's a tesselation. I've seen this definition before and this over simplification of what a corrugation is leads to a lot of errors and people considering basic pureland folds as corrugations when they clearly aren't. Merian Webester Dictionary defines corrugating as "to form or shape into wrinkles or folds or into alternating ridges and grooves", the key word here is alternating, that's what defines a corrugation despite if you see one or more layers when held up to the light. Thank you guys; I think I understand a bit more now. The article I linked shows the following two folds and declares they are tessellations. Aren't they really corrugations? If I'm wrong can you please explain why? Last edited by Gerardo on November 22nd, 2018, 1:38 pm, edited 1 time in total. There are no "alternating ridges and grooves" hence they are not corrugations. A note on this, a tessellation is the repetition of a pattern to fill b the plane, so a corrugation can also be a tessellation. Oh, the "alternating ridges and grooves" is what lets you "see the entire surface of the paper". That would avoid the accumulation of layers. Am I right? I'm not sure about the accumulation of paper thing since I've never attached to that definition. Sorry I can't link directly to the photo but I'm on my phone and don't know how to do it. WOA! Those are also corrugations? !